Before this ride I felt I needed some more time in the hills, after it, I feel like I need some more time in the hills. CJ, Danny Cohen and Wade Wallace all put me in the box by various methods through out the day. I'm not complaining mind you, it was all quality threshold work, it will make me faster.... but it would be nice to be competitive on the hills. The Elbow was first up and I started on the front, riding two up with Danny. We turned toward the elbow itself and the road ramped, I was soon riding on his wheel... then watching from behind somewhere as CJ attacked and dropped Danny at a similar rate to what Danny was doing to me. I was 30 seconds slower than last week, but averaged an 8 beats per minute higher heart rate. After working hard on the descent to the bottom of the wall, in an attempt to give Danny a head start on CJ, I took a little bit to settle into a tempo. Settling in I tried to distance myself from Wade, but he kept on keeping on, showing an annoying tendency to continue conversation despite my best efforts. This is Wade's photo, I've totes stolen it without asking permission. 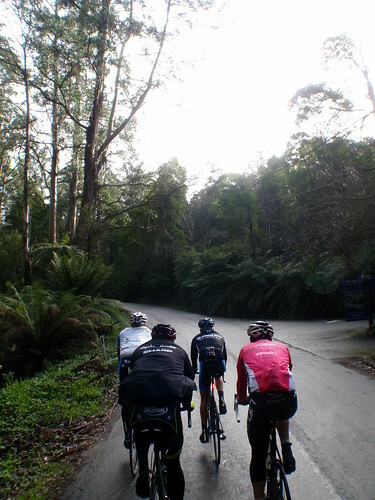 The final climb was a social affair, two up up Sass Creek rd. By social I of course mean the guys 30-40kg lighter than me chatted away and I occasionally had to concentrate very hard on pedalling. So compared to others, not a great day. Compared to some of my times, not a great day. My power numbers? Not a bad day at all. I was within 8 watts of my all time best 20 minute power (395W vs 403W). In the box time is good time.